Okay, making a starter post to help us share info about Hiram gear in one spot. Let's use this post to share info, discuss and post our findings, questions, and thoughts about this new mechanic. Q: Where can you find this gear? Q: What level do I need to be to equip/use this gear? Q: What is the max grade of this gear? A: You can take it all the way to celestial by feeding in other pieces you find. Q: Is this available on Fresh Start? Q: How does the gear work? A: The gear drops with 3 random stats, you level the gear by feeding in more Hiram gear like you would a cloak or costume. Unlike Erenor items, you can feed in any item to any other item, regardless of grade, or piece type. Hiram drops from specific mobs found in Auroria and using your larceny skill to open or identify them max cost (60 labor per), to identify the gear. Q: How good is the gear compared to X? A: Muzzy tried to explain it in the link above, but a more concise answer is, it is delphinad quality gear in damage, defense, and gear score. Q: Can you temper it? Q: Is there stat rerolls? A: Not directly.. yet... You can pick new stats if you get one you don't like as you level it, works like the cloak or costume. However no specific item like serendipity stones to reroll once you're at max grade. Advice, get at least 2 stats you want before you start leveling the gear, bad stat items just use them as fodder for the correct stats when you get it. Q: What is the drop rate of the gear. Q: How many pieces do I need to upgrade my gear from Grand-Rare, Rare-Arcane, Arcane-Heroic, Heroic-Unique, Unique-Celestial? A: Each Grand Piece is worth 100xp if you level up items to rare+ they are worth more xp. The amount of xp required to level items depends on the items, 2 hands seem to cost the most, instruments are pretty cheap compared. Higher the grade more xp required. Q: Does this gear proc bonus XP like Erenor and Cloaks? Got 1 proc for 36% on my 6th combine. Max appears to be 50%. Q: Is this gear worth it? A: In all likelihood this gear is going to be the new meta for the Fresh start, Delphinad Quality for just some labor is going to be very appealing. This is a wait and see type thing. I'm betting yes. The drop rate is insanely low if you don't farm during wartime. Seems likely less than 1 per 50 mobs or so. I'm farming with erenor gear too, and it's like poking your eyes out with a fork with how slow it is... I can't imagine doing it with GHA gear. Edit: I made it to about 150 mobs or so... still only 1 drop. Yet again, massively disappointed that the grind will take hundreds upon hundreds of hours of terrible RNG before anything useful comes of it. This reply is aimed at providing some insight to the drop rates for the new Hiram gear, as well as some miscellaneous info. First let's begin with the drop rates. Data was collected from 100 Abyssal Legion mobs kills during peace period and 100 Abyssal Legion mob kills during war. Note that War grants a 50% buff to loot drop rates, while peace periods do not grant any boost to loot drop rates. 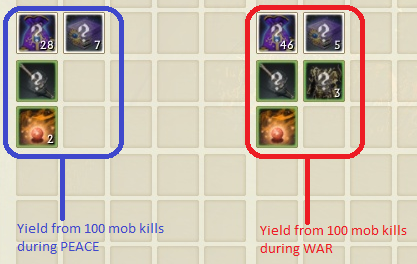 I figured that both war and peace drops should be tested as newer and lower geared players might wish to farm for Hiram gear only during peace periods to avoid PvP and whatnot. I also had 7% buff to loot drop rate due to level 8 guild buff. Also to be noted that these new mobs are capable of dropping Haunted Chests. -First Hiram related gear drop was from my 7th mob kill during war. -First Hiram related gear drop was somewhere between 50-60th mob kill during peace. These new mobs spawn in multiple locations within their respective zones under a relatively normal spawn times as other basic mobs, so players shouldn't have to worry about fighting for a farm spot. From what I've seen thus far, the new mobs come at level 51, with level 51 'strong' counterparts. They also come at level 53, with level 53 'elite' counterparts. Gold and exp rates weren't fully taken into account but they were relatively the same as the other mobs in their respective regions. Compared to illustrious, the new Hiram gear seems to have lower drop rates. advice..... bump up the drop rates a tiny bit for Hiram gear. The gear drop rate is complete horse♥♥♥♥. 3 pieces in an hour? That’s not even counting if it’s decent for you lol. 1 Hour work to get 5-10 possible BEST slot gears on Fresh Start is just awesome.